The photo booth is a way to entertain and amuse the guests at an event such as a wedding, birthday or a simple party. It’s a must and in all (or almost all) marriages can’t miss! The angle of the fun that can be created in many ways, with sofas and armchairs, custom backdrops, frames on trees and so on. For me the photo booth now is a rule, and every time I’ve to create, it becomes a challenge because I like to think how to create it in a fun way. But also elegant and exclusive. 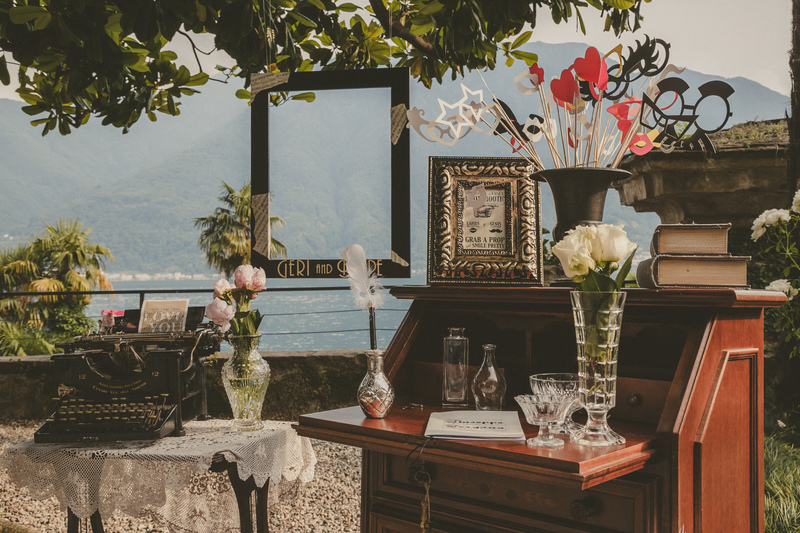 To this marriage, celebrated in Pax Villa Monastero on Lake Como, I opted for the simplicity and I decided to give it a vintage touch to my photo booth. A custom frame with the names of the spouses has been hanging on the tree, an ancient cabinet acted as a support for all the gadgets and the decoration was created with crystal vases, doilies and vintage typewriter machine. This article I’m going to give you some ideas for a photo booth DIY. To make a photo booth serves a photographic machine. Personally I love the instant photo machine, so you will have the photographs immediately to show off to guests and you’ll get a lot more spontaneity. I recommend to avoid the phones and print photos. Consider a space where they can be from 2 to 4 people. Next, you need to choose and create your background. A simple backdrop realized with a curtain hanging on the wall, or if you want something more special you can create shooting stars or a garland of lights to hang. We know that light is one of the most important elements to take good photographs. If you can take advantage of the daylight it is best, otherwise you can bet the lamps on either side of the stand and provide for adequate lighting. Part of the fun in a photo booth is the use of costumes, hats, boas and sunglasses. Especially now even more trend to use masks that you can make at home using sticks on which to attack shapes cut out of colored paper as a bow tie, mustache, mouths .. Use your imagination! At the end of the photo booth take the opportunity to make a photo album with photographs taken, in this way will not be lost and you will have fond memories of the event. And now, we go to work … Create a photo booth DIY to entertain your guests during your event.